YouTuber Rice Gum made YouTube history after starring in Monster Cable Super Bowl LII commercial alongside Iggy Azalea and many other celebrities. Inspired by the real-life story of Monster Cable founder, Noel Lee, the spot features Rice Gum as a young man who, after seeing a singer performing in a subway station, builds from scratch some headphones in his garage, which he names Monster, at a time when everyone uses earbuds. He then tries to pitch them to several company managers, but no one is interested. Eventually, he manages to get the world start using them, and this fact is illustrated in a scene featuring Azalea, Aerosmith guitarist Joe Perry, country star Big Kenny, songwriter and producer Poo Bear, hip hop artist Yo Gotti, and radio host and TV personality Charlamagne the God listening to music through Monster headphones. Noel Lee also makes an appearance as the driver of the car that takes Rice Gum through a neighborhood where all those listed above are wearing Monster headphones. “We’re just getting started.” – he tells Rice Gum. 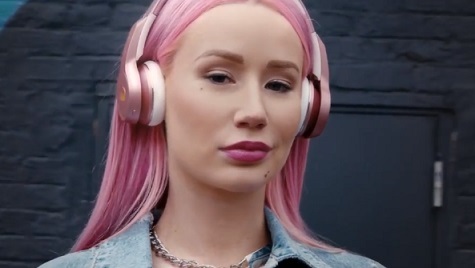 The commercial, soundtracked by Iggy Azalea’s newest single, “Savior”, featuring Migos rapper Quavo, released earlier this month, from her album “Savior”, introduces the brand’s new tagline, “You deserve better”. Noel Lee said, in a press statement, “We want people to know we’re not the energy drink”. “It’s especially important for all those who don’t know us or what our legacy is. It’s to establish our expertise and tell the story behind the brand.”, he also said.